John Watson Montgomery College Television	 Student produced weekly live newscast. Final show from the 2009 Advanced Broadcast Journalism Class at Montgomery College. 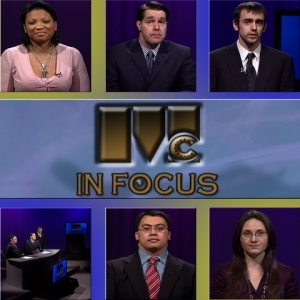 Embed "MC In Focus - Graduation Show" on your page. Embed "Show#9 - May 8, 2009" on your page. Embed "Show#8 - May 1, 2009" on your page. Embed "Show#7 - April 24, 2009" on your page. Embed "Show#1 - March 6, 2009" on your page. Embed "Show#6 - April 17, 2009" on your page. Embed "Show#2 - March 13, 2009" on your page. Embed "Show#3 - March 27, 2009" on your page. Embed "Show#4 - April 3, 2009" on your page. Embed "Show#5 - April 10, 2009" on your page.